Special Advertising Section Spinal Cord Stimulation: One Fascinating Way Dr. Ajith Nair Treats Patients with Chronic Pain Dr. Ajith Nair, M.D., knows his medical expertise can help alleviate symptoms of a chronic pain sufferer. He has spent the past nineteen years of his medical practice in the feld of Pain Management, helping thousands of patients deal with a variety of ailments that cause pain. Passive treatment of chronic pain tends to encourage dependency on narcotics, which can cause serious medical consequences including liver damage and even death from accidental overdose. Dr. Nair educates his patients so they can understand both the cause of their pain and the solution. One option that Dr. Nair uses for chronic pain sufferers is spinal cord stimulation (SCS). SCS is a safe and effective therapy that has been used for more than 40 years to help people take control of their chronic pain. Pain is an electrical signal that travels along the spinal cord to the brain. In SCS, thin, insulated wires, called leads, deliver electrical impulses to specifc locations close In their own words, Dr. Nair's patients share their experiences with SCS: C.S., a 78-year-old male from Louisville, Kentucky: "I've taken all kinds of pills for pain and all it did was fog my mind. I can't say enough how this [treatment] has released me. I am free from pain. I don't have pain in my hips, or in my legs or back. I can walk more stably. I don't have any side effects from drugs." K.S., a 53-year-old female from Southern Indiana: "I've been living with pain for 4 or 5 years on pain meds and didn't like that lifestyle. My frst back surgery was 15 years ago, then a fusion seven years later. I've tried epidurals and I've tried everything everybody has suggested to help [pain] and nothing worked. I just had the [spinal cord] stimulator put in and it is working great. When it hurts I crank it up a little and it stops the pain." S.O., 40-year-old female from Louisville, Kentucky: "I couldn't believe the difference after the procedure. It's something you can't describe to another person if they haven't felt that type of excruciating pain… and then not to feel it anymore." T.H., 56-year-old male, U.S Army veteran from Southern Indiana: "I tried the spinal shots and nothing seemed to work. Now I'm up to 75% pain relief. It's a life saver." to the spinal cord, masking the pain signals. The masked signals then travel to the brain where they are often felt as a smooth, tingling sensation called paresthesia. This sensation reduces the feeling of pain. SCS is generally considered successful if your pain is signifcantly reduced (50% or greater reduction), you are able to get back to your daily activities, and/or you are able to relax and sleep better. 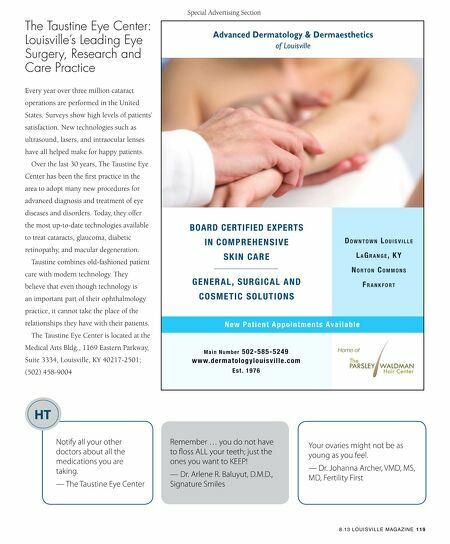 An important beneft of SCS is being able to try the therapy before having a permanent system placed in your body. If you are a good candidate for SCS pain-control therapy, the next step is taking a test drive, called a trial. During the trial, one or two temporary leads are placed in your back. The temporary leads are connected to an External Trial Stimulator (ETS), which is worn outside your body on a soft belt for approximately 3-7 days. The ETS produces the same feeling as the implantable device, so you can experience what paresthesia feels like and see whether it signifcantly reduces your pain. This trial period allows you to assess the amount of pain reduction in the comfort of your own home. To learn more, call (502) 995-4004 or visit painstopshere.org. Dr. Johanna Archer of Fertility First Cautions Against Postponing Pregnancy It's not an easy topic to discuss with women and no one likes to be told how to live their lives, but according to Dr. Johanna S. Archer of Fertility First/Reproductive Endocrine Services, there are limited fertility solutions for an aging woman who is losing eggs daily despite all the advances in fertility treatment. Approximately 20 percent of women wait until after they turn 35 to start having children. Dr. Archer explains why that might not be the best choice: "At 30 years of age women have about a 20 percent chance of getting pregnant each month, but at 40 this number drops to 5 percent." There is also a signifcant increase in genetic abnormalities and miscarriages as age increases. 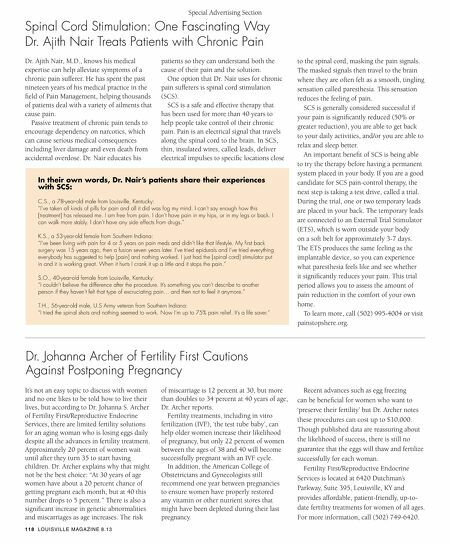 The risk 11 8 LOUISVILLE MAGAZINE 8.13 of miscarriage is 12 percent at 30, but more than doubles to 34 percent at 40 years of age, Dr. Archer reports. Fertility treatments, including in vitro fertilization (IVF), 'the test tube baby', can help older women increase their likelihood of pregnancy, but only 22 percent of women between the ages of 38 and 40 will become successfully pregnant with an IVF cycle. In addition, the American College of Obstetricians and Gynecologists still recommend one year between pregnancies to ensure women have properly restored any vitamin or other nutrient stores that might have been depleted during their last pregnancy. Recent advances such as egg freezing can be benefcial for women who want to 'preserve their fertility' but Dr. Archer notes these procedures can cost up to $10,000. Though published data are reassuring about the likelihood of success, there is still no guarantee that the eggs will thaw and fertilize successfully for each woman. Fertility First/Reproductive Endocrine Services is located at 6420 Dutchman's Parkway, Suite 395, Louisville, KY and provides affordable, patient-friendly, up-todate fertility treatments for women of all ages. For more information, call (502) 749-6420.